From its humble beginning in 1996 Goan Cafe has grown from a small tiny seed to a mature garden situated in a protected area for (Olive Ridely Tuttles Nest From Sept To Feb On Morgim Beach At The Mouth Of River Chapora In Pernem Taluka Of North Goa Still Run And Maintained By 3 Friendly Brothers Anthony, Lawrence & Paul & father who catches the fresh fish for the menu in his small boat at night, returning every morning with the catch of the day “only catch you will find at ´Goan Café & resort´. Goa certainly is a land of dreams & romance… a timeless world of gentle hospitable people & unhurried activities. Goan give you the best of Goan hospitality and makes you feel at home. With its personalized services and the rich blend of experience its personnel has to offer, Goan Cafe N Resort gives you a peaceful and special vacation that you will cherish forever. Goan Cafe N Resort is situated in a peaceful serene environment, on the shores of the Morjim Beach in the North of Goa and within walking distance from the international famous Olive Ridely Tuttles Nesting sites. At Goan Cafe N Resort you can laze in the silvery sands, bask in the golden rays of the sun or just let the soothing sound of the waves wash away your worries and the gentle breeze intoxicate you and set your soul free. 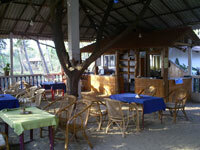 From its humble beginning in 1996 Goan Café has grown from a small tiny seed to a mature garden situated in a protected area for (Olive Ridely Tuttles Nest From Sept To Feb On Morgim Beach At The Mouth Of River Chapora In Pernem Taluka Of North Goa Still Run And Maintained By 3 Friendly Brothers Anthony, Lawrence & Paul & father who catches the fresh fish for the menu in his small boat at night, returning every morning with the catch of the day "only catch you will find at ´Goan Café & resort´. Gustine an illiterate man supported his wife & five children with hard work a song & prayer. As the trawlers took more & more fish from the sea the elder son Anthony thought he try his hand at selling soft drinks & fresh juices and coconut from a small café at the end of the family land, the beach of the Arabian sea. The first European to visit stayed in the family house and fishing net store & used bucket shower pig toilet sadly no longer used. But now flush toilet & electric shower in every apartment and several of the three houses also two for the use of the customers using the restaurant & beach area. Morjim is 63 kms from the airport, 17 kms from the Mapusa Town / 32 kms from Panjim capital city & few mile walk along the seashore to mandrem, arambol & back packers center. Nearest Railway station is Pernem, 17 kms & tivim 24 kms. Every Wednesday (hippies) flea market is just about 12 kms & Saturday night market is just about 14 kms.